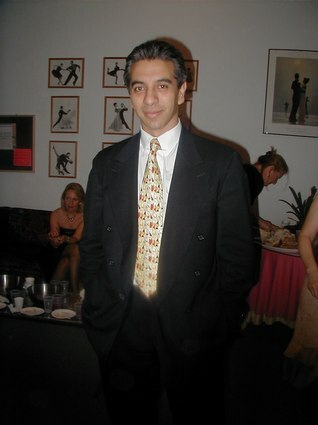 Jorge Torres is a world-renowned Tango Choreographer, Dancer, and Impresario of dance productions. He is amazing to behold on the dance floor, as he dances with a quiet and smooth style. I had the fortune of dancing two Tangos with Jorge, after meeting him at Bailemos Tango (See Bailemos Tango Candids). Jorge has charisma and character, and I thoroughly enjoyed our conversation below, conducted at MoonRock Diner, 313 West 57th Street, NY, 212.397.3131, over cappucinos. Jorge Torres is the subject of this Inside Perspective. REZ - Tell me something about your work. JT -I have been training the National Ballet of Argentina in my own Tango techniques. I mix Flamenco, Martial Arts, and Ballet. Sometimes ballet companies use the word Tango, but they do not dance Tango. In Tango I have had many partners, such as Iris Tello, Andrea Quinteros, Pilar Alvarez, Karina Piazza, and Guillermina Quiroga. REZ - What was your dance training? JT - I started dancing in ballet at three years. My main mentor was Norberto Guichanduc. He taught me how to move. I studied Argentine Folk Dance, Flamenco, and Ballet. He wanted me to have more knowledge of Ballet. When I was ten years, I started dancing at the Colon Theatre for ten years. Later, at age twenty, I received a call from Libertad La Marque, a singer, to be part of her Company. Then, I moved around. I was in Tango Passion and Forever Tango. I spent three years with Tango Passion and then six years with Forever Tango. One of my dance partners in Forever Tango was Karen Kain. She wanted to make a video of her dance life in Canada (Dancing in the Moment), and we danced A Evaristo Carriego. I was the Dance Captain of the NY Company and of the travel Company. REZ - What is your favorite performance music? JT - For myself, I like Bahia Blanca. I dance to everything. The music changes my mood. REZ - How is your Tango style unique among other dancers? JT - My type of dance is the way I am. You do not have to be similar to anybody. The main thing is what you feel. In choreography, I try to go deeply for many days, until the music tells me what to do. It's my body, playing the character that has to dance. REZ - What is unique about your teaching and your choreography? JT - What is unique about my choreography is that I feel strong, and I fix the problems of Companies and keep them "house clean". I like to educated the dancers and see the result. We need to grow up and feel freedom. We need to be most natural, because you can feel if an actor is acting, or if he feels the character. I believe in the human being. Argentine Tango is a natural dance. The people need to believe you. I talk to ballet dancers about how to caress on stage. REZ - Some projects and dreams on the horizon? JT - For the next few years, I have friends with Tango Companies in Buenos Aires, such as "Tango Seduccion". I am trying to help them make connections and also help new Companies to develop. I want to bring these Companies here (NY). I would be the Manager of these Companies. I'd like to produce a Tango show and help people make a very nice quality, to be real guys and girls, to be good dancers and have nice ideas. The simple things are nice lights and costumes. REZ - Are you from a family of dancers? JT - My mother, Dionisia Tula, and father, Antonio Torres, are workers in Buenos Aires in a huge Estanzia. My father made wine and was a train technician. My brother was a dancer like me, named Claudio Torres. I also have one nephew and one niece. My girlfriend is Sonia Capon, a Salsa Dancer, twenty-four years old. She was a student of Norberto, the same person I studied with. REZ - Tell me more about Forever Tango and your dance partners. JT - We were nominated for a Tony Award. My partner in Forever Tango was Karina, and then Guillermina. We still keep in touch. I was married to Karina. I trained her. Something dies, when you are not with your partner anymore. REZ - You have so many accomplishments. JT - In Argentina, I was a judge for the World Championships. I was one of the judges for the semi-finals and then for the finals. I was also the Director of a show, Tango Legend, last December in Japan, the same time as Tango Week in Japan. Copes and his daughter danced. Also, Gloria and Eduardo. In Buenos Aires, I teach in a Tango School, Escuela Argentina de Tango. REZ - Thank you so much. I look forward to seeing you perform.